The British Columbia Voice of Women was affiliated with the national Voice of Women/Voix des Femmes and was a women's organization devoted to the promotion of world peace. The records were transferred to the Special Collection Division by Florence Stanton, in November, 1978 . 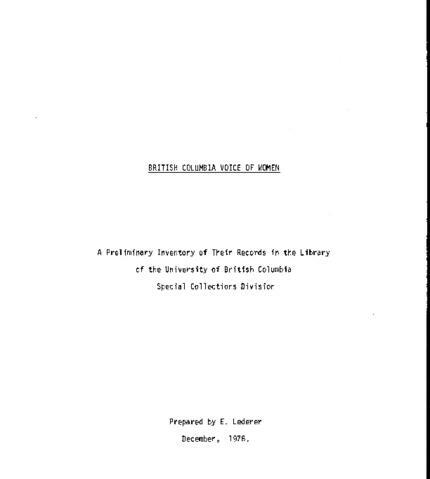 The fonds consists of the records of the B.C. chapter of the Voice of Women (1960-1978) and local chapters (Powell River, Vancouver, North Vancouver, and West Vancouver branches) include subject files, correspondence, minutes, scrapbooks, newsletters, conference proceedings, press clippings, president's papers, and financial reports reflecting the organization's involvement with disarmament, human rights issues, ecology and politics.